This is a brilliant little machine, which is the perfect partner for your acoustic guitar and compact enough to stow away your guitar case (certain full size jumbo cases only). Compact, with a good selection of sounds. Not quite large enough to provide realistic sounds at higher volume levels (for busking etc). The great thing about an acoustic guitar is that you can make music pretty much anywhere without having to lug around additional equipment. You can’t generally say the same about traditional drum kits or percussion, where some form of transport and planning is essential. 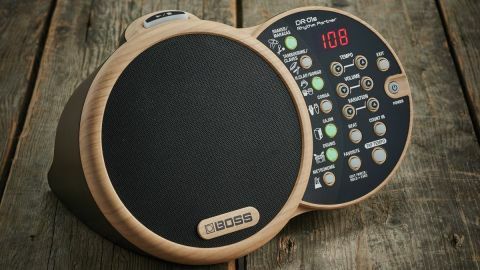 Enter the Boss DR-01s... this little device is an electronic drum machine, which is battery powered and has a built-in speaker! The DR-01s is a radical departure from the usual drum machine in that the drums, percussion and rhythms are instantly accessible from the front panel - without the need for any deep editing - just press the desired buttons and go! Even though it has a built-in speaker it’s not unwieldy. It’s small enough to place in the accessory pocket in many jumbo guitar cases! The front panel has visual indication of the instrument types beside each button. This allows you to select any combination of percussion/drums on the fly. If you wish, you can use it solely as a metronome. There are seven preset buttons which allow you to toggle the instrument sounds, on or off. Three of the presets have alternative percussion types which can be selected by the variation buttons. The buttons show a bright green light when they are on. The available instruments are: Shaker/maracas; Tambourine/claves; Handclap/bongos; Congas; Cajon; Drums; Metronome. There is a small LCD screen that displays the various settings, such as tempo, volume, instrument selection and rhythm variation. There is a button labelled ‘Beat’ that changes time signatures. There are also plus/minus buttons for tempo, volume and program variations. There is a tap tempo button which aids simple time adjustments during performance. Should you wish to change the volume of a particular instrument, all you need to do is hold that particular button down and make the change with the up/down volume buttons. To switch the DR-01s on there is a button that is inset in the front panel. This prevents accidental switching when transporting or during performance. The display says ‘see you’ when switching the unit off! Adjacent to this is the ‘count-in’ button, which does what it says on the tin. The count-in function obviously varies according to the time signature. The default count-in sound is a closed hi-hat. This button glows red to indicate that it is on. It is possible to save up to 50 presets by pressing and holding (for a couple of seconds) the ‘Favorite’ button (sic). Once you’ve selected your instruments and tempo you can use the ‘Variation’ buttons to select the patch number and then press the favourite button again to save. There is a separate exit button, should you wish to escape the edit mode - it’s all pretty straightforward really. Once you’ve saved your sounds you can recall them by pressing the ‘Favorite’ button momentarily and then use the ‘Variation’ up/down buttons to make your selection. These buttons light up with an amber colour when used in the ‘selection’ mode. Mounted above the speaker is a larger button that is used for start/stop function. Below this, mounted in the top of the speaker is an LCD that ashes to indicate the current tempo. The first beat of the bar ashes red, while the remaining beats ash green. Should you wish it, these colours can be changed in the edit function. The DR-01s is made from a tough, brown plastic with a light coloured wooden surround. interestingly, the speaker grille is made from a fine metal mesh, which is much stronger than the cloth varieties, making this a pretty bomb-proof unit. The front panel and speaker are angled back by around 20 degrees to improve access and the directional sound characteristics. The base of the machine is covered with a 3mm rubber mat to reduce any potential vibration when placing it on a hard surface. 01s through an acoustic amplifier or a PA system there is a line output socket (3.5mm). There is also a standard 6.3mm jack on the back to allow you to control the machine with either a single, or double footswitch. You can control a variety of functions with the foot switches, ranging from stop/start to triggering individual sounds. Below the jack sockets is the battery compartment, which houses six AA batteries for stand alone use. In use this is the perfect little machine for home use and jamming with your friends. It has a fabulous selection of realistic tones and is very easy to setup and edit. With 50 programmable presets and simple ‘on the fly’ editing you have the perfect partner for your acoustic guitar. Used in conjunction with an acoustic amplifier or PA system you have the ideal gig rig!